(CNN) -- Sen. John McCain on Friday said as president he would consider bringing Osama bin Laden to justice through a Nuremberg-like international trial. 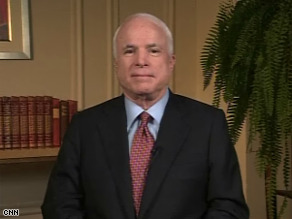 Sen. John McCain appears on Friday's The Situation Room. He told CNN's Wolf Blitzer, "We have various options. The Nuremberg Trials are certainly an example of the kind of tribunal that we could move forward with. I don't think we'd have any difficulty in devising an international -- internationally supported mechanism that would mete out justice. There's no problem there." McCain said it would be a "good thing to reveal to the world the enormity of this guy's crimes, and his intentions, which are still there." When asked if as president he would move the U.S. embassy in Israel from Tel Aviv to Jerusalem, the presumptive GOP presidential nominee unequivocally stated, "Yes." Asked when, he said, "Right away." "I've been committed to that proposition for years," he said. McCain said he wouldn't discuss hypotheticals when asked whether he would support an Israeli attack on Iran, but did say, "I can tell you this: The United States of America is committed to making sure that there is never a second Holocaust. That will be what I do as president of the United States." "I am stating the facts. The facts are that I don't question Sen. Obama's patriotism. I'm sure that he's a very patriotic American," he said from Denver, where he will meet with the Dalai Lama. McCain argued Obama opposed the surge and doesn't "understand the importance of this victory and the consequences of failure and the benefits of success." McCain and Obama have different views on how to handle the situation in Iraq. McCain says troop withdrawal should be based on conditions on the ground, but Obama advocates removing all combat brigades within 16 months of taking office. Iraqi Prime Minister Nuri al-Maliki appeared to back the idea of a timetable in an interview with the German magazine Der Spiegel over the weekend, but an Iraqi government spokesman said later the prime minister's comments were "misunderstood, mistranslated and not conveyed accurately." The magazine has said it "stands by its version of this interview." The Bush administration has opposed timetables for troop withdrawals, but al-Maliki and President Bush last week agreed to a "general time horizon for meeting aspirational goals" on troop cuts. The news comes in the wake of conservative criticism about al-Maliki's statement. Washington Post columnist Charles Krauthammer wrote Friday that al-Maliki, "voted for Obama, casting the earliest and most ostentatious absentee ballot of this presidential election." Asked if he would support al-Maliki's intentions, McCain said "I know Prime Minister al-Maliki rather well. I know that he is a politician, and I know that they are looking at upcoming elections. I know that he knows and the other leaders know there that it has to be condition-based. "I can assure you that Prime Minister al-Maliki understands that conditions have to be kept." Asked what he would do if al-Maliki insisted a withdrawal was needed, McCain said, "He won't ... I know him well." "He said it's a pretty good timetable based on conditions on the ground. I think it's a pretty good timetable, as we should have our horizons on withdrawal," he added. "We will withdraw. We have succeeded. The surge has succeeded, and we're on the road to victory. And we will be out of there and may have a residual presence of some kind," McCain said.